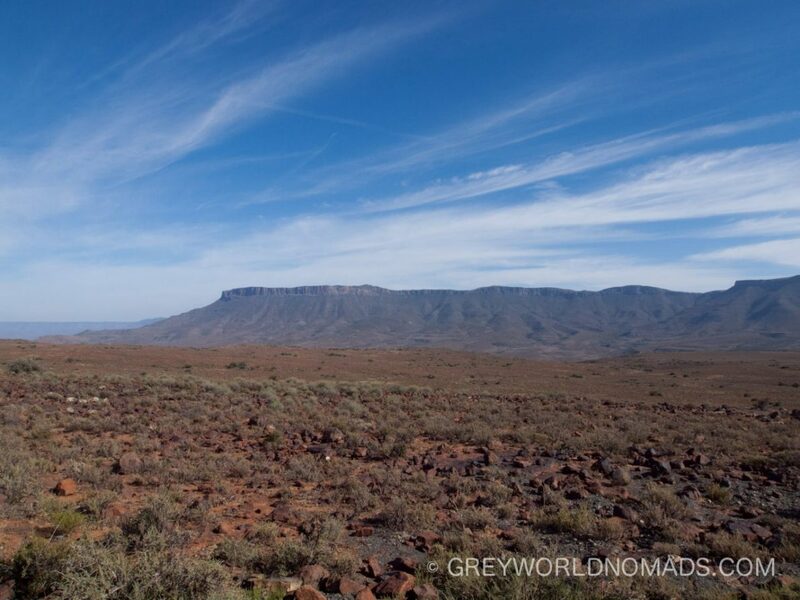 The last National Park on our trip through the Karoo lies in the Nuweveld Mountains north of Beaufort Wes. 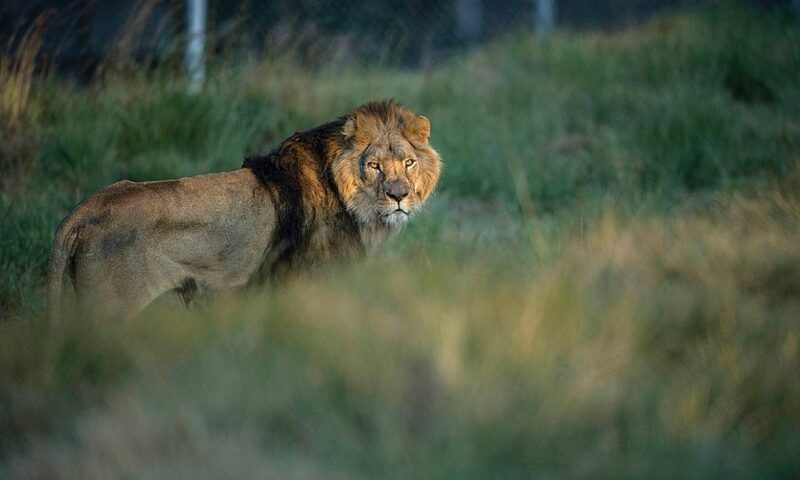 The park became most famous because of a troublesome Lion named Spook, who managed to escape twice from the national park boundaries and brought the surrounding farms into a state of alarm. A large male lion is not to be taken lightly. Spook walked 300km from the park, killing 30 animals over three weeks! The ranchers managed to dart him and was eventually relocated to Addo Elephant National Park, where he hasn’t escaped up to now. Maybe he found some likeable female lions there. 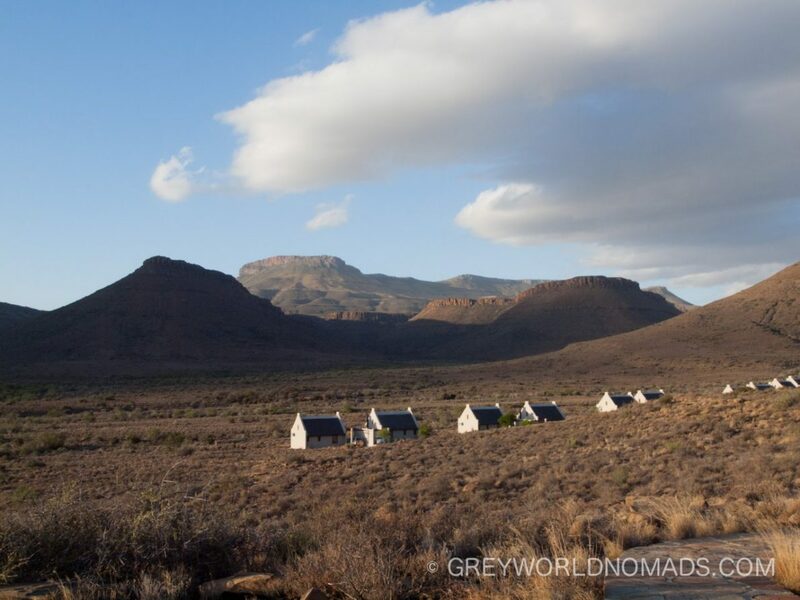 The huts and main house of Karoo National Park’s rest camp are located about 1 ½ km from the campground. We figured only later, when we’d set up our tent and the wind picked up massively, why the national park authorities had planned this so wisely. The campground is situated in a slight depression, therefore the wind couldn’t send our “not-at-all-wind-resistant- housing” into the desert. Rugged shaped, red mountains surround the camp and give it a feel of a wild-west movie-scene. Our visit being in spring we experienced the rare occasion of some rain, almost freezing temperatures in the night and sizzling heat in the day. During mid-winter it happens occasionally that snow covers the peaks. Take that into account if you plan to camp and take an extra blanket! Within the fenced area walking paths are signposted and a theme path with various fossils of the Late Permian Period some 255 million years ago gives an insight of the time, when herbivores, lizard-like insect-eaters roamed the Karoo before dinosaurs evolved. 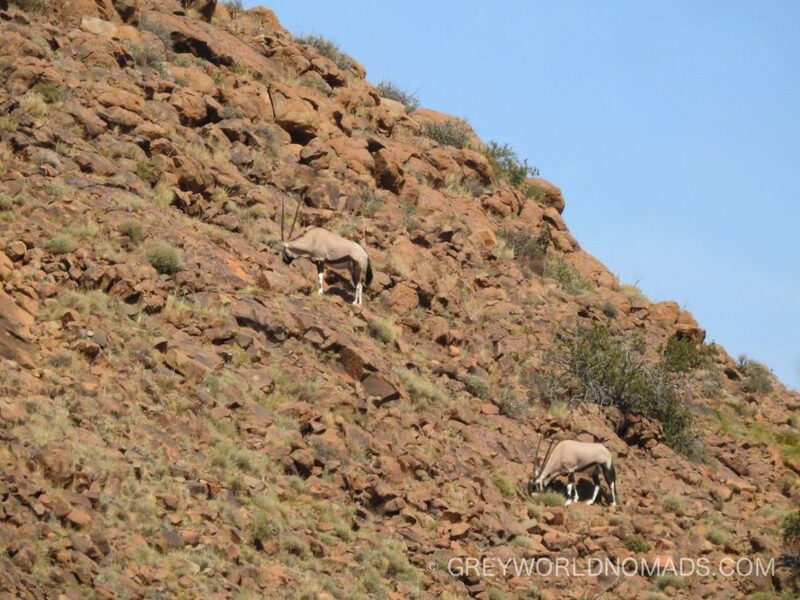 We didn’t expect to see much as the wildlife has more than 750 square kilometers to exploit in the Karoo National Park. 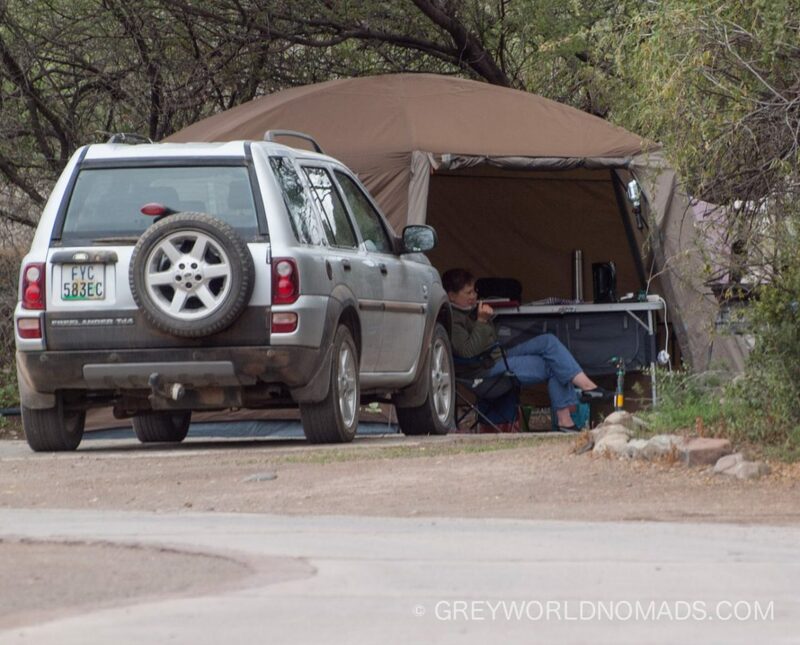 Most of it is only accessible by 4×4 with high-ground clearance and low gear, which our Land Rover lacks. The early sun didn’t warm up the chill yet, when we saw a small family of klipspringers on our right and shortly afterwards a gemsbok on our left. We were drinking coffee from our flask with the typical South African breakfast rusk – a piece of sweet, dried bread which gets soaked in the coffee – enjoying the view over a breathtaking ravine. All of a sudden two black eagles (Verreaux’s eagle – Aquila verreauxii) approached at eye level from the bottom of the ravine, to lift up over our heads in the air. Repeatedly they returned after a half hours detour, only to make us hope to see their graceful maneuvers one more time again. In the following days we were lucky to encounter the black eagles at the same spot and in a valley further ahead again. Once we even had the privilege to see one of them bathe in a rock pool to cool down during the afternoon heat. 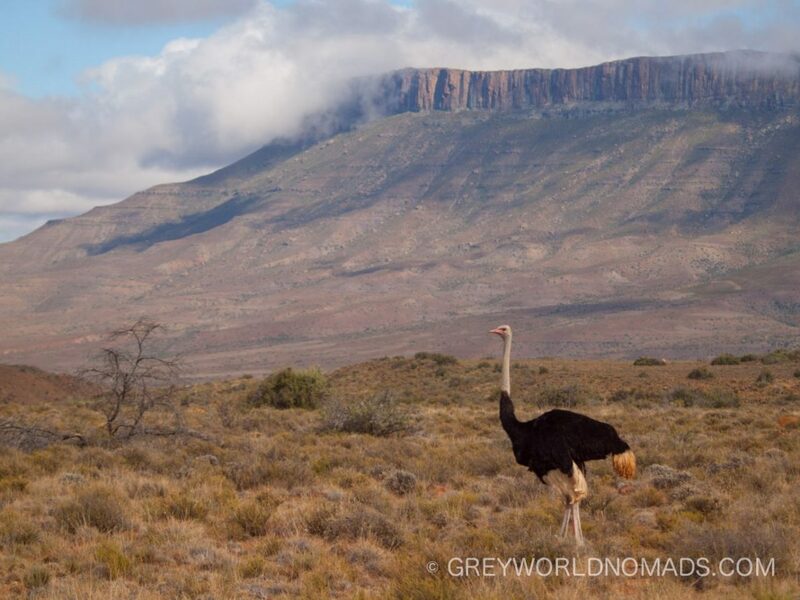 The Karoo National Park boasts one of the world highest concentrations of breeding black eagles. We saw a abandoned nest on a steep cliff. The black eagles build their nest at such inaccessible places, so as to provide safety for the young from the marauding baboons. We didn’t spot the lions nor any other predators during our stay but a glimpse of a black-backed jackal. The herds of Cape Mountain Zebras and various antelope species made up for it. Not to forget about the myriads of birds waking us up in the morning and the best, the black eagles hovering in the wind just in front of us. We left the Karoo National Park one day before the full moon would be closest to the earth since 1948. The so called “Supermoon” looked pretty impressive already night before.